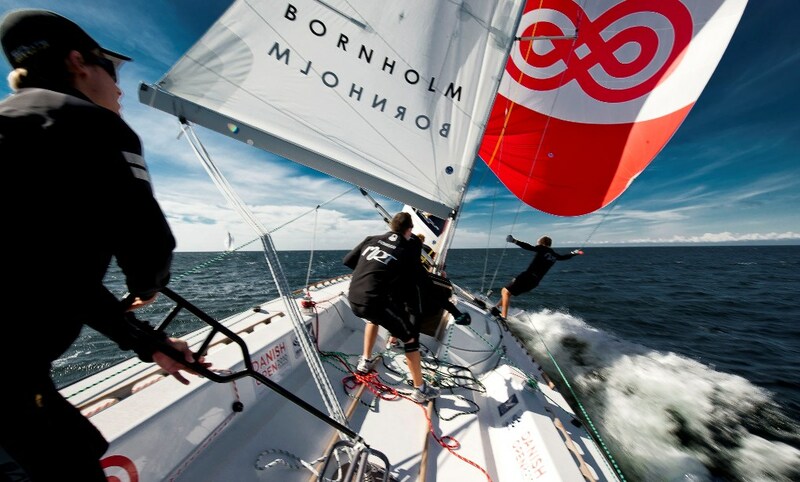 Mirsky Racing Team fly downwind at the Danish Open. Image copyright Loris von Siebenthal/WMRT. Blustery conditions off the coast of the small island of Bornholm tested the skills of all of the teams in the Danish Open, but it was the Mirsky Racing Team who came out on top. The only loss came against Team Azzura who managed to roll MRT on the first downwind and fought well to defend their lead across the difficult race track. "These boats are really loaded up, especially in these conditions in Borholm so you have to work really hard to keep the boat under control but keep going as fast as possible" said Mirsky's trimmer Kinley Fowler. "It's funny though, because the whole day was such a big learning curve for all of us. If we hadn't been rolled by Azzura, we wouldn't have been able to beat Ben Ainslie in the next race when he tried to roll us on the final downwind because we wouldn't have fully worked out all of our systems." Tomorrow looks to bring more wind, so the learning curve will continue to climb up as MRT look in good form to make the top 4.